You can enjoy the history of the Vikings trail through Vikingskipshuset in Oslo. Scandinavian countries do share the history of the Vikings, so that each country has a Scandinavian Viking museum mainstay as one of their tourism appeal. You will feel the loss when the Scandinavian travel without a visit to one of the existing Viking museum. Scandinavia is synonymous with the history of the Vikings. So, you must experience the history and culture of the country of Viking origin. Vikingskipshuset located in Bygdoy, location a little museum on the edge of downtown. To reach the museum, you can use the bus number 30 goals Bygdoy or ride ferries departing from pier in front of City Hall. Mileage using the ferry faster than the bus ride. In addition, the ranks of the ship that rests along the pier into a pleasing sight, you can ride the ferry to Bygdoy to pay a ticket for 40 NOK or free if you use the Oslo Pass. Vikingskipshuset admission amounted to 60 NOK or free if using Oslo Pass. A large Viking ship will be ready to greet you once you enter the main room. Vessel filled with simple and traditional carving was named Oseberg Viking Ship. 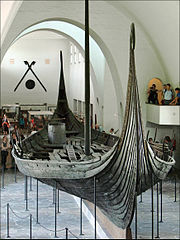 Information posted on the Oseberg Ship mention that a Viking ship Oseberg from 834 BC used for funerals. It is a culture for the Vikings to bury their dead in the ship. The bodies were buried with the supply of food and drink, gold, jewelry, and silver in preparation for the surge. Oseberg Ship not also missed the mark tomb raider so much jewelry and relics lost during the Oseberg Viking Ship found. Pretty creepy history of this ship. especially when you see the Oseberg Ship of balconies available, your belly will be nauseated imagine there used to inhabit the body of a woman this big ship. In addition to the Oseberg Ship, Vikingskipshuset also has Gokstad Ship. Unlike the previous ship, Gokstad Ship used as warships, transport, or trade. Gokstad Ship dubuat in 890 BC with a length of 24 meters. Holes located along the ship is a place to hole up paddle that can be used when the ship did not get blown away. Gokstad Ship is the largest ship in Vikingskipshuset with better conditions than the Oseberg Ship. Even so, fame of Gokstad Ship as has been not eaten by time, no longer posed a creepy feeling when tourists see this ship. Unlike the Oseberg Ship that looks remain elegant even old age. Another ship was almost destroyed by the conditions in Vikingskipshuset decorate another room. Tune ship was called the Ship, there is no specific information that tells the story of Tune Ship. Tune Ship in the back looks a traditional Viking tent with two boats to complement the decor. In addition to the three Viking ships, Vikingskipshuset displaying some Viking heritage, such as beds, horse-drawn carriage, wood carvings, and sledding. From the collection of the visitors can see works of art and design where Vikings long ago. The Viking museum is not very big, but contains relics of the Vikings were very valuable. By visiting Vikingskipshuset, you can see and experience the glory of the Vikings who once ruled the europe seas, people who have great power and high culture.